Rover Thomas's superb 'Kankamkankami' (1989) depicting the cave that Kankamkankami created to hide two boys whom she wanted to circumcise. Somehow, the Aboriginal Art Directory failed to report the death in March of a woman of great importance in the development of Aboriginal art – Mary Macha. She grew from a West Australian job in the State's Native Welfare Department to handling many of the most significant early paintings to emerge from the distressed Warmun/Turkey Creek community in the East Kimberley. Rover Thomas was her particular protege, so much so that, controversially, Macha's provenance for his work became the auction house benchmark rather than that of his community art centre. And many price records were set. From there, her wings spread across the Kimberley to Bardi Country and down into the Carrolup watercolours from the south of WA. “In March of this year, Mary Macha, one of the most important figures in Australia’s Indigenous art world, passed away at the age of 94. Her contribution to this field cannot be understated. Throughout her life she worked tirelessly and passionately towards the cause - even in her final weeks, enthusiastically describing to visitors the book we were working on about artist and friend, Butcher Joe Nangan. In the early 1970s, in a period when Aboriginal art was generally considered to be restricted to areas of Central Australia and Arnhem Land, Mary pushed and promoted Indigenous art produced in Western Australia and fought for the recognition of West Australia's Aboriginal artists. Initially, Mary was employed by the then West Australian Government’s Department of Native Welfare to be both the Manager and Project Officer of the Native Trading Fund. Her role ensured that many the initiatives of many small local cultural focused artists and craftsmen were encouraged and rewarded. In 1973 she was to head Aboriginal Traditional Arts, the West Australian branch of the federally run marketing organisation, Aboriginal Arts and Crafts Pty Ltd. This was the major outlet for West Australian Indigenous Art. On its walls, one found the works of Nyunga watercolourists from the South-West, artefacts from the remotest regions of the Western Deserts and rare works of art that were derived from the Kimberley and Pilbara. 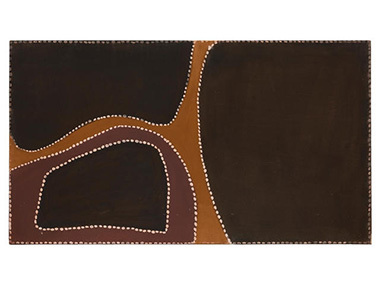 Collages of bark rubbed shoulders with carved emu eggs, museum class artefacts, Arnhem Land bark paintings and the emerging acrylic works of Papunya and other Central Australian settlements. With a small cohort of volunteers, people working within Indigenous communities in remote areas, Mary encouraged the production of art and the maintenance of traditional skills wherever possible. Among Mary’s early coups must be considered the revival of Bardi raft making skills by Tommy Thomas and later, Roy Wiggan. Her interest in the Wanjina art of the north and central Kimberley elevated the form from a tourist-oriented commodity to high contemporary fine art. Mary promoted and marketed works by now-deceased artists as the late Alec Mingelmanganu, Geoffrey Mangalomara and Manila Kutwit, as well as members of the Karadada family, who produce works of art to this day. As well as promoting contemporary art forms Mary was also concerned that traditional skills associated with the production of material culture should be encouraged and maintained. As well as reviving the craft of raft making she also encouraged the production (at Kalumburu) of dugout canoes and many other all-but-forgotten artefacts once common in the northern and arid regions of Western Australia. Mary also worked closely with Nyikena artist Butcher Joe Nangan, whose brilliant watercolours and engraved pearl shells are grounded on traditional values, and are only now receiving the recognition they deserve. Mary sponsorship Roy Wiggan and his innovative thread-cross sculptural forms - the ilma dance ornaments within the Bardi culture. Mary also encouraged the production of materials, initially produced for open dances, as art objects in their own right. The sculptural forms associated with Kalumburu composer Geoffrey Mangalomara’s Cyclone Tracy dance cycle, created in 1975 are but one suite of theatrical materials promoted by Mary. It was Mary's recognition of the strength of the works by Paddy Jaminji associated with the Goorirr Goorirr ceremony at Warmun that led to the emergence of Rover Thomas, one of Australia's most significant contemporary artists, and the development of the most radical Australian art movement of the late 20th century, the Warmun or Turkey Creek school of art. These artists presented a totally new perspective on how to present the Australian landscape and the traditional values embedded in it. As wider interest swung towards a re-evaluation of the importance of Aboriginal art as a reflection of the national identity, many institutions and collectors sought Mary’s advice as they developed their own collections. 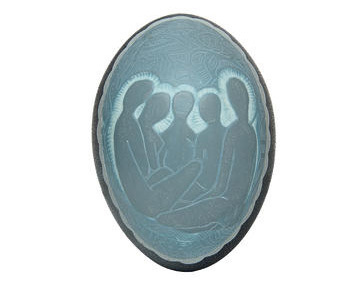 Since 1983 Mary Macha had been in private practice, running an Aboriginal Art Consultancy. Mary acted as a consultant to many private and public collectors and institutions as well as curating the Indigenous section of the Lord MacAlpine of West Green Collection. Apart from the massive cultural impact art in the Kimberley has today on the wider society, it should also be recognised that this development is of enormous economic benefit, not only in terms of individual artists and their communities but to the region as a whole. Mary has with characteristic modesty, always let others take credit for, what is really, rightly, her own success story - the international recognition of Aboriginal art in Western Australia. Mary's role, when we look at the Aboriginal Art world of Western Australia, must not be forgotten and should not be unacknowledged”. 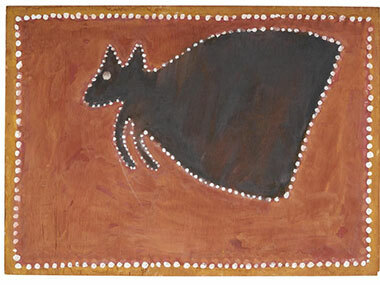 An early Paddy Jaminji, 'Tawurr the Kangaroo' (c.1978/79), from the Goorirr Goorirr cycle, natural earth pigments and bush gum on plywood.